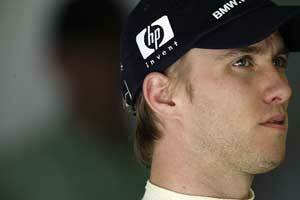 Heidfeld began racing in 1988 and in 1994 he moved into cars in Formula Ford 1600. He won eight of the nine races inhis first year of competition and the following year finished second in the German national championship. This led to a drive in Formula 3 in 1996. He won three races in his first season and the following year won the title and did his first tests with the McLaren Mercedes team, thanks to the support of the German car manufacturer. In 1998 he continued to do McLaren testing and moved into Formula 3000 with the West Junior Team (a McLaren subsidiary) and won three races but failed to win the title as a result of losing pole position at the final race as the result of a mistake by the team over fuel. He was forced to start at the back of the grid and despite a strong drive lost the title to Juan-Pablo Montoya. In 1999 remained the McLaren test driver and stayed in Formula 3000. He won four races and the F3000 title. He was also a member of the Mercedes team at Le Mans until the cars were withdrawn because of their tendency to flip. In 2000 he joined Prost Grand Prix but failed to make much of an impression. He signed a three-year deal with Sauber and stayed with the team until the end of 2003 when he moved on to the struggling Jordan team. However support from BMW helped him to win the second Williams seat in 2005. He did well, finishing second at Monaco and the Nurburgring, and at the end of the year was signed to drive for the BMW Sauber operation in 2006. Things did not go well at the start of the year but Heidfeld got a wake-up call when the team replaced Jacques Villeneuve with Robert Kubica and ended up on the podium in Hungary and ninth in the World Championship.